I agree with you -- the test cited in the DIY article says flow is effected if you use the tiny hole vs cap open, but considering the amount of flow that will actually take place, I don't think it will matter. I mean.. it's about 1 quart of oil every 2 months that will go through. I just wanted to check what everyone else was doing. btw, It's been two days since I put in the mod (Drove maybe 50 miles). I don't yet see any purple oil in the OMP tubes. How long did it take to start to see flow? It looses the color almost right away - probably on the first one or two drive cycles. Look at the color on the dipstick. I was anxious too for the oil to start feeding through the OMP lines - it took 2-3 hundred miles for the oil to go into the lines all the way to the motor. Obviously, if you run it harder, it will happen faster. You may also notice some small air pockets in the lines (about 1/2 inch long) as well that will have to work there way out - not be a concern and will bleed out as well. Last edited by Jax_RX8; 03-13-2007 at 10:13 AM. The male and female connectors turn and move. The connector on the side of my engine didn't seem to move. Does it move to adjust flow on the MOP? Or is it stationary? The connector on the side of your engine does move, but may have been fixed/still while the motor is off. I do not recall if my motor connection was fixed or free moving, only that I had to take great care to align these connector "keys" for the adapter and OMP itself. These keys are used to adjust the base flow rate for the OMP based on load (and can be fixed if you like with the "adjuster") - and the flow increases from the base with RPMs via the "stepper" some refer to. The way I see it, it's too much money to turbocharge the renesis engine and not pay attention to the fine details. I also run the aluminum adjuster from Sohn along with premix, but then I can just hear how many rx8club experts will say it's overkill. Is the same the oil consumption (injected oil) with the Sohn adapter as with the original MOP (engine oil)? Maybe the MOP uses a little part of the engine's oil pressure, to get the right amount of oil injecting to the chambers. With the Sohn adapter, the MOP can't get engine's oil pressure, just a little by the gravitation. Agreed - I am using at the exact same rate before and after - 1 qt to 3000-3200 miles. I think I'm closer to 2100 - 2500 miles per quart. But it's hard to estimate because the bottom of the washer bottle is much thinner than the top. My usual rate is somewhere around 2500-3000 per quart, but I'm not driving my car as much as I used to since I'm working from home a lot more these days. When I do take the car out, I thrash it around, so burning more oil should be expected. I was originally very concerned because of the tubes leading from the omp to the engine wasn't the color of the oil I was using. The tubes remain discolored, but I'm very sure it's burning the oil, so I'm quite happy with this mod. The OMP is indeed a pump, the engine will see the same amount of oil with this adapter, unless you are using the adjuster. I reassembled a Renesis MOP. It can't work as a pump. I did not see any parts in it, which can build up any pressure. I think, the engine gets the oil by the vacuum of the expansion, and by the regulated (low) "main" oil pressure which push the oil in to the MOP. The OMP is a true, positive displacement pump. However, it is not self priming. 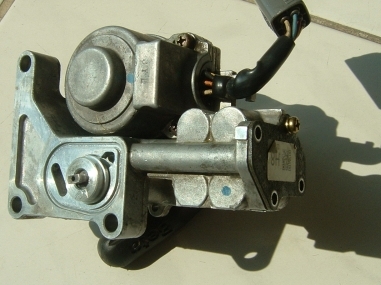 Meaning, the oil inlet has to be full of oil in order for the OMP to pump. 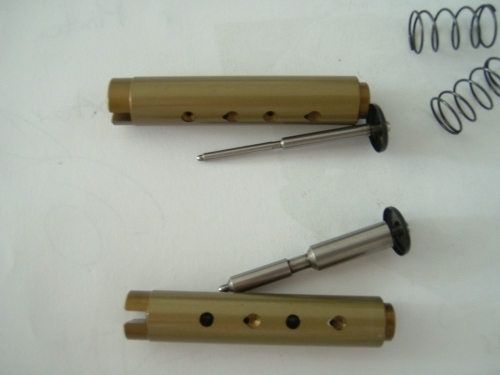 The OMP is using a piston and ports for controling the stroke, there are no valves. For the above reason, all it requires is an oil tank, which is located higher than the pump, assuring oil in the inlet at all times. In the MAZDA engine, this is achieved by maintaining a small over pressure from the engine oil system. 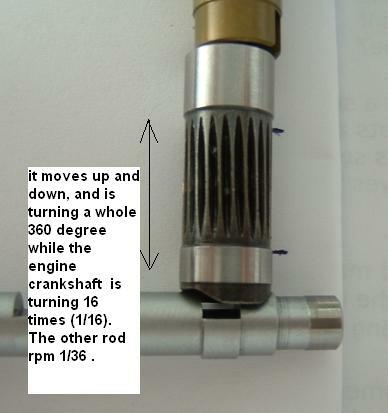 I have tested this function on the bench, in addition to the no-leaking through the OMP when the engine is not running. Thanks for these important infos. There are two pistons in the Renesis MOP which are fixed. There are cylinders (with a lot of holes) around these pistons. These cylinders only (and really only then) move up and down, when the stepper motor changes the position of the excentric shaft of these cylinders. It's happen very rarely - only when the engine's working parametrics are changing. So the two pistons with their cylinders only decide the amount of the oil, doesn't push it to the nozzles. So the question is: How can make pressure the MOP? As I said earlier, I think the engine gets the oil from the MOP by the vacuum. The small over pressure from the engine oil system gives a little more pressure to the system, without it, the amount of the injected oil must be smaller. Maybe only a little smaller. I don't want to be cleverer than RS, but I tried the MOP, driving it by an electronic driller, and I did not see any sign of oil pushing (pressure). Last edited by ayrton012; 08-05-2007 at 12:06 PM. 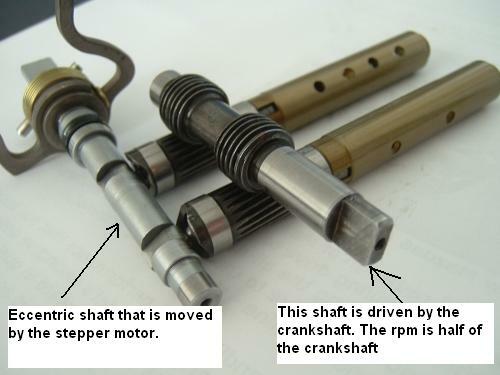 The piston pump stroke is variable and controlled by ports? How is that? There has to be some control, or a relief valve, otherwise the flow would be entirely determined by engine speed. ayrton012 did you take pictures of the disassembled pump? 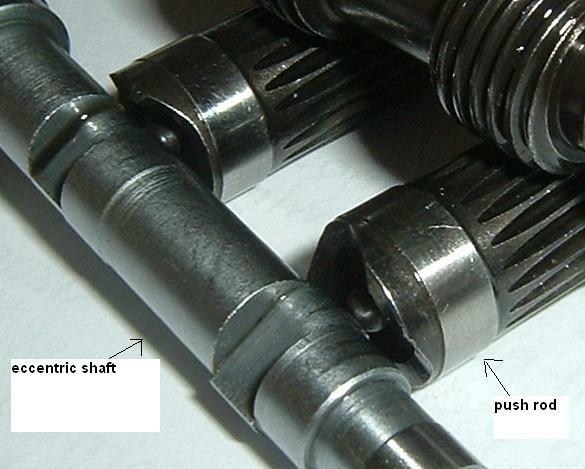 What is the input shaft connected to? When you drove it with the drill, how did you ensure it had oil at the input (Sohn adapter?). I used a tank, connected to the MOP with pipe. The connection of the pipe and the MOP was well sealed. I'm absolutely sure in this moment, that the MOP can't work as a pump. Now only one thing has left which I would like to know, how much is the importance of the oil's pressure, which get the MOP? Ayrton, don't you think that dissassembling a pump and claiming that "I'm absolutely sure in this moment, that the MOP can't work as a pump. " is a little arrogant? "The operating principle of this simple pump escapes me, so it cannot possibly work...." might not be more accurate? I can see immediately how it works, just from that photo if the parts. Mechanics 101. 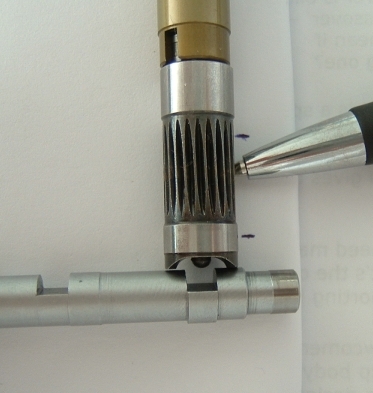 The key is the thread on the two "driven" shafts - the contact area is much longer than it would be if it remained stationary, therefore it slides. The cams on the bottom of the driven gears provide the pumping action, the stepper twists the lobes on the control shaft to vary the length of strokes - this isn't rocket science. Thanks for the picture, I've always wondered how that works. Well, I had to change my point of view. Look at the picture! The push rods are always turning when the engine working. The push rod's ends is waved so as the rods are turning, its move up and down. This up and down moving is controlled by the eccentric shaft. Bigger at high rpm's... So the MOP is a pump! The last question: is the gravity feed same with the pressurized feed? gets more lodgical to modify the needles for more pump flow. The follower surfaces on the rotating shafts appear to ride on the circular part of the control shaft so no amount of stepper motor rotation would change their stroke length. There seems to be a center movable rod in those shafts that actually contacts the cam on the control shaft and this would be affected by stepper motor rotation. It could be that this rod is connected to a stationary piston (positioned by the stepper) which is enclosed by reciprocating cylinders. 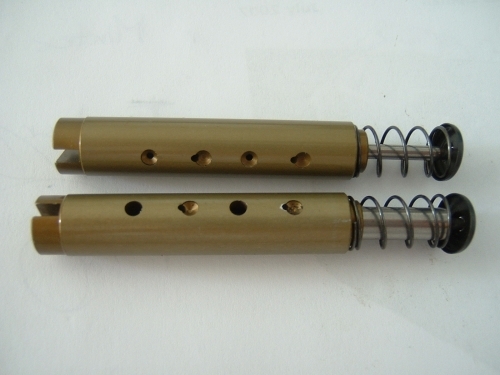 The cylinders have holes in them so that relief occurs at points dependent on the position of the piston. And what about those needles? where are they? Are they in fact inside those cylinders (if that is what they are), rather than pistons (what I thought they might have been)? Last edited by Delmeister; 08-07-2007 at 09:33 AM. It was not the question now. I beleived that the MOP can't pressurize the oil to the nozzles. But now I have to say, I was wrong. These are statements of someone who is trying to find the truth. You might compare his post with StealthTL who first reprimands him for his arrogance and then points out his stupidity. This is then followed by his own conduct which almost exactly mimics the conduct he ridiculed. Four more pictures to understand the MOP's working too.